Recently while talking with students, I said that one of the benefits writers gain from reading widely is learning how different types of writing sound. I wish I'd remembered Phoebe Stone's The Romeo and Juliet Code so I could have used it as an example. 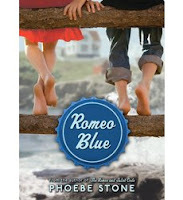 I remembered it later while reading her follow-up, Romeo Blue. In this second book about new teenager Felicity Bathburn, the young Brit is still living with her Maine relatives who are deeply involved in the U.S. war effort during the 1940s. Her mother is missing in France. People are being drafted. And Felicity is in love with Derek who has been raised by her grandmother, aunt, and father. Felicity and Derek have a lot of spy business going on around them. It's both interesting and sometimes a bit far-fetched at the same time. What's really striking about this book is, as you might have guessed, the way it sounds. I'm talking about more than just a first-person narrator's voice. What Stone is doing here is creating a world in which people sound as they did seventy years ago. My recollection of No Ordinary Time Franklin and Eleanor Roosevelt: The Home Front in World War II by Doris Kearns Goodwin involves a gee-whiz, retro language from the people she writes about. You get a lot of that in Romeo Blue. In addition, Stone has to make Felicity sound like a 1940's British girl, one who is a bit on the immature side. And, yeah, that part is voice. But because so many people speak so distinctively in Romeo Blue, I think we're talking about sound, the sound of a whole book world. World building is important in all fiction but in historical fiction it carries as much weight as it does in science fiction and fantasy. Sound is a big part of a world. The Romeo and Juliet Code and Romeo Blue would make a good binge read. Once you are into the world and its sound, you can stay there a while.